The above article “Be Pakistani, Buy Chinese” published today in Express Tribune, says it all .. The sentiment embedded in this article cannot be overlooked. The anti-Chinese undercurrent which was seeping from the cracks for long is now seen surfacing slowly. This article ascertains the same and voices out concerns of the majority of the Pakistani’s who have knowingly or unknowingly been swept away by the Chinese tsunami in Pakistan. Today the Chinese influence can be seen in every sphere of Pakistan’s governance and culture. In times to come, this “Chinese-Biryani” may be hard to digest, as predicted by few internal & external analysts carefully watching China taking over Pakistan. The Chinese debt trap is just one aspect of this tsunami, the bigger issue is the “cross culturization” which is hitting Pakistan in a big way. Pakistanis suffer from the effects of an identity crisis. They have their own common experiences, from mass migration to war. Pakistani population is constantly under strain; there’s a domestic problem in terms of security and there’s an international problem in terms of insecurity. Religion is the lifeline of Pakistan but it appears that religious patriotism is now under Chinese threat. Earlier it was seen that most of the Pakistanis tried to associate themselves with the Arab culture and traditions. This caused a lot of damage as people became more and more unaware of own culture, history, language, traditions and got more inclined towards the Arab culture. But with the changing times, it is the “Chinese mania” which has overtaken the Arab mania and a little China Town is seen mushrooming in all cities of Pakistan. The following few incidents in the recent past would allow “sinking in” of this Chinese mania in Pakistan. 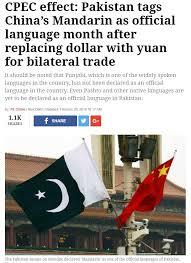 False reports of Pakistani Senate approving a motion to declare Mandarin as one of the official languages of Pakistan (stating that the relationship between Islamabad and Beijing would deepen further and help the people connected with the China Pakistan Economic Corridor communicate easily with this move), did the rounds few months ago. This news was played up; sparking numerous debates. Few in favour with the rest looking at it as a very bold step by Pakistan (which is akin to threatening rather eclipsing its identity in times to come).This can be suitably argued as in a short span of 70 years, Pakistan has flirted with promoting four languages that were not the mother tongue of many people in the country-English, Urdu, Arabic & now Chinese. Surprisingly Punjabi (which is widely spoken in the Punjab province of Pakistan), Pashto; and many other native languages have not been declared official languages of the country. Earlier Pakistan had turned down China’s demand to allow its currency to be used in the Gwadar Free Zone under the China-Pakistan Economic Corridor framework, arguing any such move would compromise its ‘economic sovereignty’. However, China made it amply clear about its egoistic urgency to have an economic influence over the USA. Priority for China-Pakistan Economic Corridor (CPEC) termed as the “flagship” project of ‘One Belt, One Road (OBOR)’initiative, assumes far more important for China, as the total cost of the project amounts to $62billion from the initial estimate of $46billion.One wonders that if that is the case, what made Pakistan take the initiative? When the Chinese department at NUML was first opened in September 1970, there were only two Chinese teachers and 13 students. This number has now swelled to dozens of teachers and almost 2,000 students, according to the department. This year alone, 1460 students have been admitted into the programme. The growing interest in the language has led to some Mandarin centres mushrooming in Pakistan’s major cities. In Islamabad alone, many prominent schools and institutes including NUST, COMSATS, Headstart School, City School, Beaconhouse School and Roots School are teaching the Chinese language. In May 2017, the first-ever Chinese language weekly newspaper ‘Guashang’ was launched in Pakistan along with its English version. The newspaper which has its head office located in Islamabad is aimed at the Chinese community in Pakistan. There are some 400,000 Chinese nationals living in Pakistan and around 25,000 of them reside in Islamabad. This newspaper is a big hit among Chinese as well as Pakistanis. 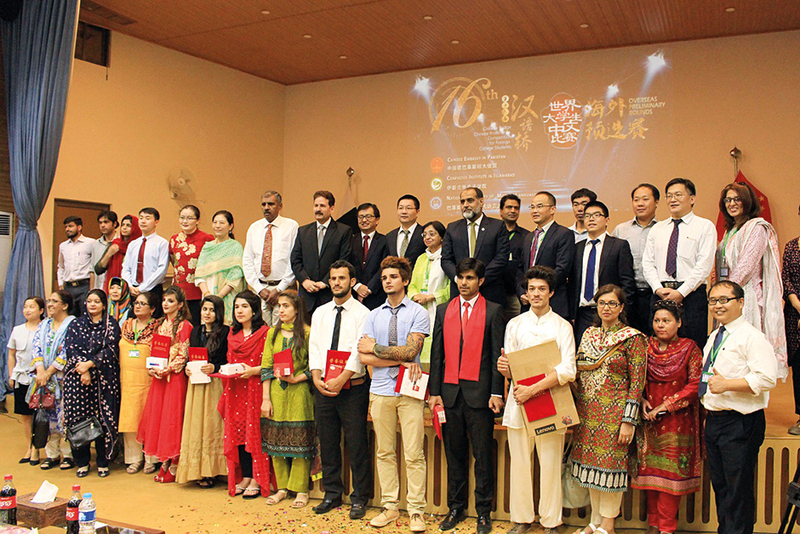 Cultural exchange programmes and celebrations to mark the Chinese New Year festival in Pakistan have further instilled the love of the language in recent years. CPEC has lured Pakistan in a big way, but the fact that Chinese are bringing their own to carry out these projects (right from engineers to labours) have left majority of the Pakistani’s high and dry. To please the Chinese, atrocities on own people have been carried out, many who tried fighting for their rights were either wiped out or have gone missing as they were seen as a threat to CPEC by own government and Army. Continuous imports in the name of CPEC from China whose value has increased by 30% in the last two years have also become a burden as there is no export recovery in sight for Pakistan industry. Thus, leading Pakistan economy to Abyss. Other than this a Special Security Division (SSD)comprising 9,000 Pakistan Army soldiers and 6,000 para-military forces personnel has been set up for protecting Chinese workers and projects under CPEC. The cost of raising the SSD was Rs0.5 billion and it took a year to be raised. The government has also allocated Rs1.3 billion for CPEC security in addition to the efforts of provincial governments. Chinese troops will also be allowed to position in Pakistan to protect the 3,000-km-long CPEC that connects the Gwadar Port in Balochistan to China’s Xinjiang region. Learning a new language is productive and would do no harm. But letting Chinese influence to grow in each sector (economic, defense, infrastructure, educational social, cultural, religious) and turn Pakistan into a China Town is creating an undercurrent which is often reported but quietly curbed by the officials. An increase in Chinese-Pakistani marriages,the presence of Chinese missionaries in Pakistan, Chinese outsourcing intelligentsia from Pakistan, Grand celebration of Chinese new year in Pakistan, surface from time to time but are usually curbed. 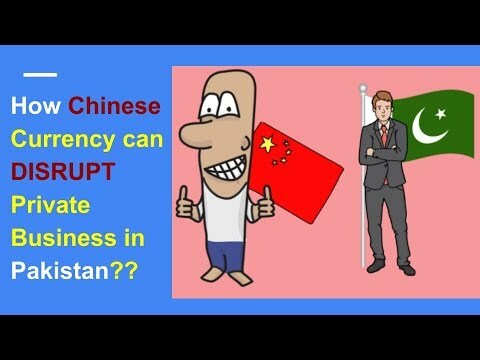 Pakistan should not forget that China is a capitalist country when it comes to dealing with other countries and towards their own people act as a communist country. They are ruthless and only think of business. For them the national goal is supreme. The Chinese once again did not mince their words when leaving out Pakistan to defend itself in UNGA when India attacked Pakistan on its outlook on terror. In return for full cooperation with China in CPEC and surrendering its defense completely, the only thing that Pakistanis got is debt overburden and a cunning friend. As far as Military Research and Developmental help given, Chinese are dolling out only those outdated technologies which they have already discarded. But with the US-Pakistan relation hitting an all-time low and the growing Pakistan-China cultural relations, economic cooperation, and presence of Chinese companies in Pakistan; has not left Pakistan with too many options but to look towards China for their sustenance. Turning into an economic slave was by choice, however, it will be interesting to see that what follows after currency & language, most likely the communist/dictatorship culture would seep into the cracking Pakistani democracy.